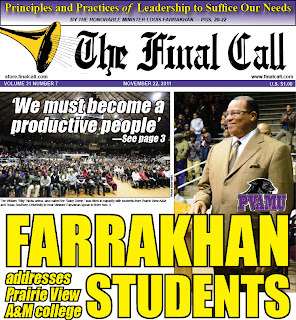 PRAIRIE VIEW, Texas (FinalCall.com) - The Honorable Minister Louis Farrakhan told students November 9 they must use knowledge they are gaining to free Black people from dependence on their enemies through becoming producers and leaders in providing needed services. “The person that has knowledge has potential power to remove any impediment in the pathway of our progress,” he added. Speaking at Prairie View A&M University for the first time since December 1988, Minister Farrakhan addressed nearly 4,000 students in the William “Billy” Nicks arena with words of wisdom, encouragement and guidance. The audience sat and listened attentively for nearly two hours as the Minister in his unique way, gave instruction from the Bible, the Holy Qur’an and historical anecdotes, to prepare the minds of the next generation of Black leaders. Prairie View A&M offered him a $5,000 honorarium to appear, however, he turned it down and asked them to give a scholarship instead. Prior to his arrival, the campus was buzzing with excitement and there was electricity in the air of the arena. Even though many of the Black fraternities, sororities and other organizations were preparing for various events related to its approaching homecoming celebration, this particular Wednesday night event was a time for serious reflection and sober-minded thinking. In his remarks, the Minister challenged the “bourgeoisie” thinking that often infects the minds of the Black community’s educated class. “What is the purpose of education? Are we just in school to get an education so that we can go out and get a job and make some money, ride in a car, live in a nice home, abandon the ghetto and leave your brothers and sisters behind and think that we’ve made progress in the world? Is this what God intended when he asked us to go after knowledge from the cradle to the grave?” he asked the audience.